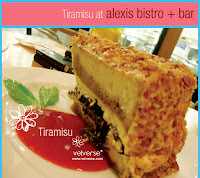 Got a piece of tapau (take-away) of Alexis tiramisu for late dessert at home last weekend. And for breakfast the next morning. Yum! Alexis makes one of the best tiramisu I've ever tasted. Highly recommended if you are visiting Kuala Lumpur, or if you live here but haven't tried it yet. * Thanks to Mandy for letting me use the picture.